The breakfast dishes are cleared and we have a few moments before it’s time to leave for school. The energy will shift soon, moving forward toward the door, looking for your boots tangled with the others on the porch, your ears full of last-minute reminders. But for now, we have time to sit together. There have been math problems and conversations about the relationships between numbers. Lucy, you have been studying the map of Peru and asking me to search for cities on it on my phone, so you can see photographs of them. Desmond, you have been playing with your figures, pretending one moment to be Harley Quinn and Wonder Woman the next. Today’s word of the day was foreign, which was in your well-thumbed copy of El Deafo, Lucy. And we talked about how humans seem to feel anyone too different than them needs to be set apart. Foreign is as strangely non-specific a word as ethnic. You seemed confused. I understand. It’s Desmond’s birthday on Sunday, with a shared birthday party with his dear friend X on Saturday, so this week’s shopping lists includes the need to make a giant gluten-free dairy-free birthday cake I will decorate on Friday afternoon and gluten-free pigs in a blanket. Your dad and I want to try this recipe for no-crab cakes made with hearts of palm and artichoke hearts for seafood night tomorrow (and then I explained the word irony) and Melissa Clark’s lemongrass-coconut chicken from her new book, Dinner, for Monday. We start to make a list of all the ingredients I’ll buy this afternoon with you, Desmond, while you’re at dance class, Lu. You listen to us as we talk about the vegetable patties. Your dad wonders if he should buy a lot of fresh artichokes and cook them for the hearts. “Honey,” I tell him.” That would take a lot of time. I know you love fresh artichokes, but do we really have the energy for that this week, with a birthday party, a movie on Sunday, and you working both nights?” He agreed. Let’s buy the jar. Lucy, you wondered which one would be cheaper, since we’ve been talking about budget. And that gives me the chance to talk with you about what I mean by budget. It’s not all about money. When most people hear the word budget, they think about money. It makes sense. The original sense of the word comes from the Middle English. A budget was what lay within a bougette, a leather bag. There’s a story that a British lawmaker talked about what the government spent as being the equivalent of what is in a householder’s bougette. It’s the image that has stuck all this time — a bag with finite space, either bulging with coins or empty except for one coin amidst the lint on the bottom. Everyone wants to avoid the lint. The problem is, when we think of our budget as only of money, we define ourselves through money. Whether or not we have coins in our bag becomes our sole definition of ourselves. Around here, we also talk about our budget for time, energy, and space. Those are as important to us as money. No leather bag contains those. Our friend, Hillary Augustine, really helped me to put this into words. She’s very wise, this one. She has a master’s degree in accounting and one in counseling, two areas that don’t usually go together. Hillary has helped me to see that words like budget and money and finances are usually enmeshed in fear. But really, they’re simply stories. A budget is the story of how you spend your time, energy, space, and money. A tax return is the story of your year — a birth, a new business, medical expenses you didn’t expect, money you meant to save but didn’t because traveling called to you, impetuously. And how you deal with your budget — whether or not you deal with it directly or let money drip out of your account or spend too much or refuse to spend more than a few dollars a day or put it all on credit cards because you wanted that thing — is how you deal with your life. Do you make decisions rationally or emotionally? At the last moment or far in advance? With tactical strategy or spontaneous feeling? Do you intend to be one way and live another? Or do you act on what you know, modifying and changing as you learn more? That’s the kind of budget conversation that interests me now. Why do we spend money on the things we spend on? How much do we want? How much do we actually need? And again, let me remind you, your dad and I never used to be very good at this. We grew tangled in our own stories, enmeshed in fear, spending too much because we felt bad about ourselves, then bought new cookbooks or more kitchen equipment or trips to San Francisco to make ourselves better and give ourselves a treat. We’ve made a lot of mistakes. We’ve learned from them. You’ll make mistakes, your own mistakes. But we hope that talking with you about this will help you avoid some of our mistakes. Hillary said to me, one day at the grocery store, that she talks to her clients about a budget for money, but also a budget for time, energy, and space. This had never occurred to me. I’ve been thinking about our decisions this way ever since. Let’s think about a simple example. 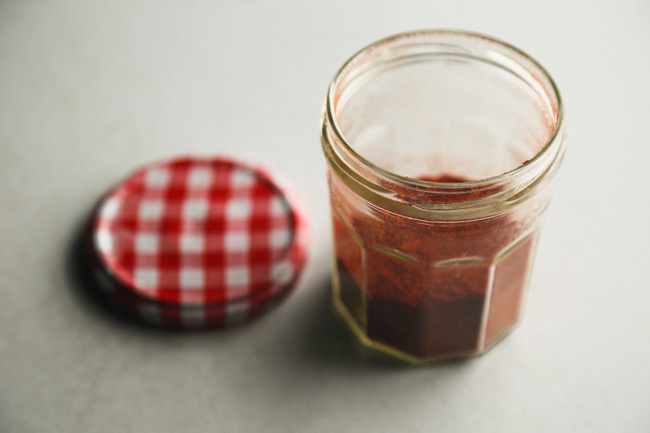 You know that making your own tomato sauce might be less expensive than buying it in bottles. But do you have the time and energy for it? Do you have space in your life and your kitchen to make a big pot of tomato sauce once a month, cool it, put it into freezer bags, then pull out a bag each week to meet all your pizza, pasta, and shakshuka needs? No? Then it might be better to buy the jar. Make every decision you have with your time, energy, and space in mind and you’ll be forced to be conscious and intentional. That’s always good. So you see, a budget is not just numbers. And it’s not all about money. But let’s start with money, since that’s where everyone else begins. There’s a phrase I think of regularly: hungry ghost. The idea in Buddhism is that hungry ghosts are those with enormous empty bellies, long narrow necks, and tiny tiny mouths. No matter what these hungry ghosts are able to put into their minuscule months, it will never satisfy those enormous bellies. So they crave more and more and more. They yearn and reject what is now for what might come. Frankly, psychologically, this explains so much behavior in the world, especially America right now. It certainly explains our belief that bigger, shinier, fancier things will make us happy. It doesn’t take long to see that merely acquiring a thing makes not one difference in our happiness. Still, we’re convinced it might work for us, when we do it our way. So if we buy the most expensive car, we might feel better about ourselves. Or the food package with the most labels — non-GMO, vegan, certified GF, local, fair trade, organic. None of it will make us happy. This endless striving — the best deal, the best job, the best status update, the best response to someone else’s ignorant statement — it’s built into the fabric of this culture. We are a nation of people who act like hungry ghosts. We elected one as president. No one needs a gold-plated bedroom. But there seem to be a lot of people who believe having the new, shiny thing will make their troubles cease. I read an article back in November, when journalists and writers were interviewing people to try to understand why the election went the way it did. (I’m still trying to understand.) One piece featured a woman who said that she is struggling, working two jobs, single mom, not enough money. No one should work that hard and still be short of money for the basics. That’s something you’re going to have to understand, the hard truth of this place. We don’t have a society created to make sure that people have their basic needs met, without fear. We have a society created to give the illusion that everyone can become rich, if they work hard enough. There’s that hungry ghost again: work harder, do more. Let me tell you this — if you have a trust fund from birth, that might be true. For that woman interviewed in the newspaper, it will always be much harder. And if you’re a person of color, an immigrant, or have a religion other than Christianity? Gay? Disabled? Mentally ill? A woman? Twice as hard. Three times as hard. So I have empathy for that woman. But here’s what struck me. She voted one way because she resents the fact that life is harder than she had been told. Her teenage son wanted a new pair of shoes, the kind of ridiculously expensive pair that are all show, no use other than making other people feel bad that they can’t afford this kind of shoe. You’ll both want some shoes like this (or something equivalent) at some point. It’s built into the framework of our society, after all, this wanting. And she hoped that her vote would change society enough that she could afford those shoes someday. We are not going to get you those shoes, Lucy and Desmond. Or the new Lego set at the grocery store you have been wanting. And we are going to tell you why. For your dad and I, having a budget means having intentions. We want to do everything we do with the clearest intentions we can. And part of that intention is knowing why we want to spend money. What will that thing make you feel? Will you actually be a better cook with a fancy French cooking pot? Will your food feed you better when it’s served on handmade ceramic plates? Do you need a treat to feel better after a lousy day and nothing will do but that ice cream from our favorite local shop, even though ice cream at the grocery store is less expensive? If you ask yourself the hard questions and get clear about your intentions, then buy the French pot, the ceramic plate, the ice cream. (We buy that ice cream once a week, you know.) Just be clear. I’ve said it in every one of these letters and so I’ll say it again: having a budget in the first place is a privilege. It means you have enough reliable income to be able to plan. Intentions, hard questions about the money we spend, the decision whether or not to buy the ceramic plate? Those are privilege. As our friend Tita said to me one day, “When you have to choose between having the flat tire on your car fixed and eating the next day? That’s when you’re really broke.” Having a clear budget in place might help you avoid that state of panic. Consider other people in your budget, not just yourself and your family. Consider the folks who don’t have much and decide if you really need the most expensive version of something, to distance yourself from them, to make yourself feel better. Don’t buy the cheapest version of something just to make yourself feel less guilty either. Make a conscious decision and find the least expensive version of something you need that will feed you well. Oh, we Americans are big on changing our lives. But generally, the changes that matter only happen gradually. That’s why I’m always cautious when I hear someone exhorting others to completely change their diets for a better life. Go on a cleanse. No grains or sugar or anything processed. No coffee either. Green smoothies for breakfast. Everything clean eating. You’ll feel so much better about yourself. Okay. An elimination diet can be really useful if you’re trying to figure out if a specific food is bothering you. But realize that doing something like this means giving away all the food you “can’t” eat to people you know so you don’t have cookies or brown rice or the fruit snacks you like in the cupboard so you aren’t tempted. And then you have to shop and prep and chop and cook and make sure you have a refrigerator stocked with food ready to eat when you are hungry, food that is acceptable on someone-else’s-idea-of-how-you-should-eat diet. You’ll need to devote most of your time to making food. This will be your full-time job for awhile. Do you have the time for this? Making food from scratch takes time. A lot of time. You know that your dad and I love to cook. Not everyone loves to cook. I have a feeling that both of you will appreciate it but you’re too young for me to say that with certainty. However, there are plenty of people out there who don’t like cooking, who feel intimidated by it. For those folks, being told they have to make everything from scratch to be a good person is frustrating as hell. They don’t have the time to learn how to make everything themselves. Especially when they don’t enjoy it. So balance the idea that making foods from scratch is less expensive — knowing sometimes that’s a myth — with a solid understanding of how much time it will take to make that food, time you may not even enjoy, and that’s how you decide your budget. Does it cost more to buy frozen cauliflower rice than to make it? Probably. Would you have to buy a good food processor to make it easily? Do you insist on organic produce so a large head of cauliflower costs $7? Do you have the time to rice the cauliflower yourself and put it in bags to use it all up? Or are you going to buy the cauliflower with good intentions, not have the time to make it, and end up throwing it away the next week? That’s not a good use of your budget. Decide how much time you want to spend shopping, prepping, and cooking. Make that part of your budget decision too. Right now, you both see us cooking often. We talk about food, plan out the week’s meals, write up the menu so we can anticipate what we’re going to eat, do a big shop once a week, talk about recipes, do a baking project together once a week, remember our favorite meals together, make smoothies in the morning and make homemade popsicles with the leftovers, make sourdough bread, and eat breakfast and dinner together every day. That’s a lot of food in our lives. For us, food is deeply important. We feel like the way we feed ourselves matters. I love the meditative calm that can happen when I chop and drop onions into hot oil. (There’s not much meditation in cooking with a 2-year-old, but soon you’ll be three, Desmond, and then you’ll be older and the kitchen will be calm again. I’ll probably miss the jostling you and Lucy do over who gets to stand on the chair next to me while we cook. Probably.) Cooking together is a great way to have a conversation. This matters to us. That’s why we spend so much time on our food. But I haven’t always had the energy for this. Before I was diagnosed with celiac, I was so sick and tired all the time that I was reduced to eating only small shreds of rotisserie chicken from the store across the street from my apartment and hunks of warm bread from the bakery. (And then I found out the bread was making me sick and tired, so I stopped that.) As much as I loved food, I didn’t have the energy to make it. Before I moved to New York, long before I met your dad, I had been an ardent vegetarian. I made all my meals from scratch, balancing my beans and rice for best protein. Then I moved to Manhattan, grabbed egg sandwiches from the bodega on the corner for my breakfast, and dreamed every night I was eating chicken. So I started eating meat again and cooked on the weekends. Riding the subway and the crosstown bus for my work meant I didn’t have the time or energy to cook all the time. That tiny NY kitchen meant I didn’t have the space. It was a phase of my life when I didn’t cook much. That’s the thing. Everything changes. You’ll have phases in your life where you want to cook all the time. And then you’ll have phases of letting everyone else do the cooking for you, either in restaurants or in meal trains when you’ve had a baby or there’s an illness or death. Pay attention to your energy. Pay attention to how much time and bandwidth you have for cooking. And pay attention to how much you are enjoying cooking in this phase of your life. If it becomes a constant, daily chore to cook? Eat simple foods. Budget for more meals out. Let yourself have some time off. Make a budget for how much joy you have in your life too. Plan for daily bursts of joy. Joy is really the only point of all of this. If there isn’t much joy in cooking for you, at the moment, it will come back. This one is the most theoretical of the four but it might be the most important for me now. When you create enough space in your life to relax and be present, all the other details don’t matter as much. You might be tight on money, you might not have the huge energy to take on a big new project, and you might not have much free time. But if you have created space in your budget to slow down and savor your meal? You won’t need the fancy meal out. Let me give you a more concrete example. It takes time and money and energy to create a garden. First of all, you have to have a little plot of land, or least a few pots on the windowsill. In some ways, it makes much more sense to forget the garden and buy the vegetables at the farmers’ market instead. No rototilling. No weeding. No buying of seeds or starts. No failed plants. No measly peas. No deer eating the nearly grown lettuce you were hoping to harvest that day. Gardening can be heartbreak, a costly time-sucking heartbreak. Then again, so is life. And when we put our backs into digging up the earth, planting, composting, hoping, tending, and watering, we’re rewarded with more than vegetables. We have a space dedicated to food that really matters to us. This has been the rainiest winter I can remember. The sun has stayed hidden behind a wall of grey rain for months. However, every morning, when I wake up and hear the rain on the roof, I think: this is going to be a gorgeous spring. And when it’s summer, and the sun is out at 5:30, and I throw open the back doors to read on the porch and look at the kale unfurling in the sun? That space will provide far more than food for us. We’ll have a place to stand on warm earth in our bare feet and pick something off the vine to make that moment. All that work is worth it for me, right now in this phase in my life, to give to you both. That’s the space I want to create for us. Luckily, on Vashon, there are plenty of far more experienced gardeners who can help us figure out how to do this without too much heartbreak. Think of your life as your space. Who will you invite in? How do you feel when your space is cramped? How does your budget affect the space in your refrigerator? Your kitchen? The dishes on the counter? (We’re still working on that one.) How do you make more space for yourself by the way you spend your time, energy, and money? As you can gather, kiddos, none of this happens quickly. That might be why I like living on a budget more than I ever imagined. If you’re going to plan ahead, shop for the week, balance what you want with what you need, and change it every week? You have to slow down. You have to devote your time to it. You have to make space in your schedule to sit on the couch with cookbooks strewn about you and the person you love by your side, imagining the week together. You have to do all this with intention, clear and joyful intention. So many people think of living on a budget as deprivation. I used to think that way. So did your dad. But instead a budget can be a clear set of principles by which you want to live your life. Limitation breeds creativity. And for us, it has made us slow down and ask good questions of each other and ourselves. It has calmed down our lives. We hope that you’ll move forward into the world with calm and joy, asking hard questions and sharing your meals with people you love. One of the best ways we know of making simple meals easy each night is to make big batches of roasted vegetables, cooked grains, and prepped greens one day of the week for the rest of our meals. And the way to make each week interesting is to make a different dip each week. This one? Well, we made it because we had leftover roasted peppers from another recipe. 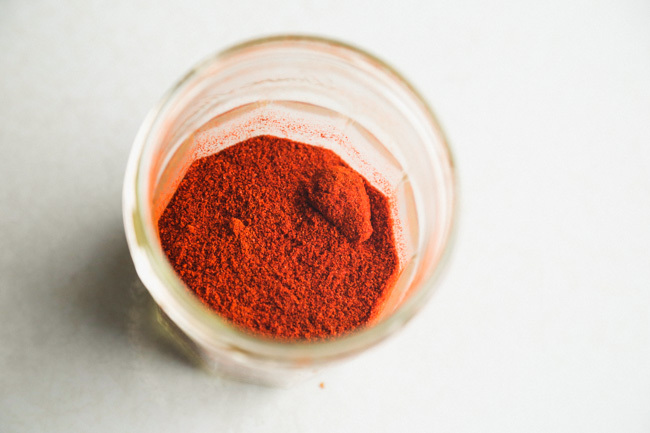 I love smoked paprika so much, plus it amplified the roasted pepper taste. And we had all the other ingredients in the kitchen. So, even though I love this dip, I hope you use it as a template for making a good dip with what you have in the refrigerator already. 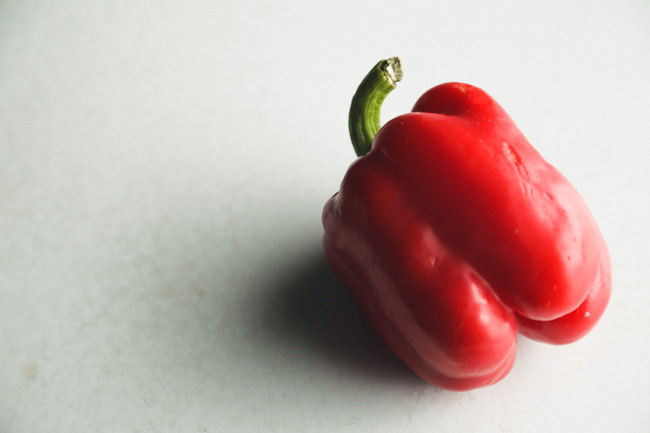 We have given you the instructions for how to roast your own red pepper. But if you have some roasted red peppers in the cupboard already, use those. When we call for mayonnaise, we’re going to let you decide what to use. Vegan? Use your favorite vegan mayonnaise. You want to make your own mayonnaise with olive oil or avocado oil? Great. Tell you the truth, we used Best Food Mayonnaise, because got a deal on it at Costco. Also, every chef we know loves Best Foods (Hellman’s on the East Coast) mayonnaise. 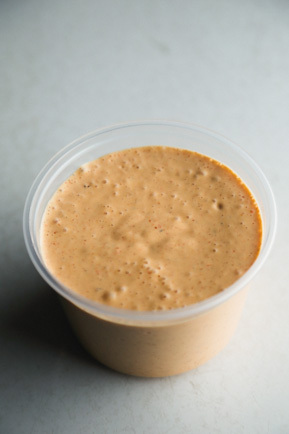 They use it in their restaurants because it’s consistent and emulsifies better than homemade mayonnaise ever does. So use the mayonnaise that best fits your budget. Heat the oven to 425°. 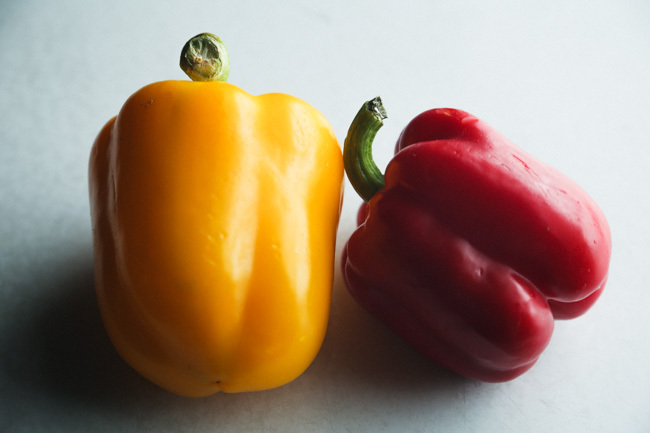 Cover the red pepper in half the olive oil. Put the pepper in the oven. 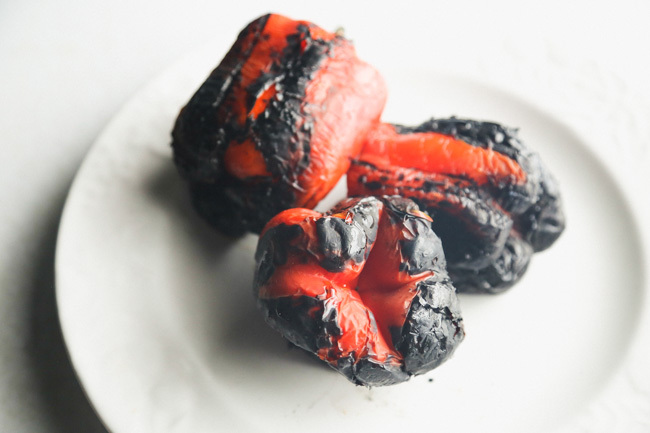 Roast the pepper until it is blackened outside, like the one in the photograph above, about 35 minutes. Take the pepper out of the oven and put it in a paper bag. Close it up tight. When the pepper has cooled completely, scrape the blackened peels off the pepper. (If they are being stubborn, use a wet paper towel to scrape off the peel.) Cut the pepper in half and drain the water that will be inside. Scrape out the seeds. Dice up the pepper. Put a skillet on medium-high heat. Add the remaining olive oil. When the oil is hot, add the garlic. Cook the garlic, stirring frequently, until the kitchen smells of garlic, about 2 or 3 minutes. Take the skillet off the heat. 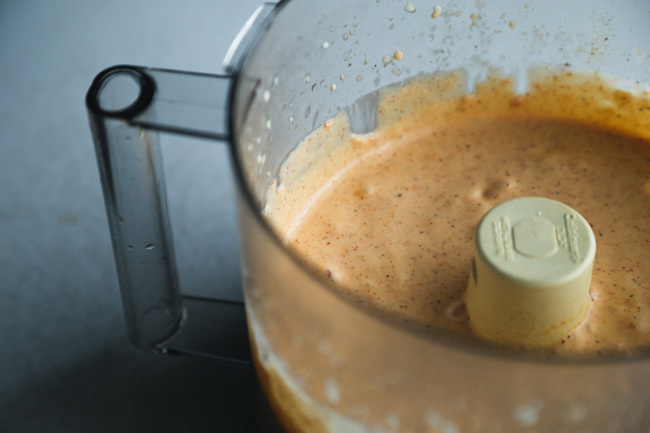 Plop the mayonnaise, smoked paprika, lemon juice, roasted red pepper, and cooked garlic in the blender. Blend it all up until smooth. Taste the dip. Add more lemon juice, salt, or smoked paprika, according to your taste. This dip should last in the refrigerator for about 1 week. What an amazing post to your children and to the rest of us. I write about frugal living and love to cook (recently found out I am gluten intolerant which led me to your blog). I love the words you share here and your views on not only budgeting your money, but time, space, and energy also. Well said and your writing speaks volumes. Thank you. I enjoy listening to Dave Ramsey’s podcast for the advice he gives callers in various phases of life for budgeting and financial planning. The budget gives you freedom and boundaries at the same time while you make room for your dreams and priorities. We’ve made the mistakes too with credit cards and stuff. These words of yours are beautiful legacies for your children., and living them in front of your kids-priceless. Well done. Thank you for coming back like this. I think this was said before by someone else, but I am also one of those who had to step away over the last year because it didn’t seem like you as much as your sponsors, and the tone seemed defensive. This is the mother/cook/writer/teacher voice that I once loved. Welcome back! I too am working through a time/energy/money budget for food, and I’m looking forward to your new wise words. I have a chronic illness and am an introvert. So for me, I always budget my time and energy. Big plans for Saturday? Probably not going to do anything on Friday. Have to work on Tuesday? Probably going to stick close to home on Monday. Have to attend a crowded event or party? Going to try to be alone before and after. I love how you applied the concept of budget to so much more than money. Brilliant! I wish my parents had been so insightful. Thank you for making me think of every corner of my life being budgeted! Its a good thought but also very scary. I act like I am Donald Trump with my time and all. So its time for a different mindset. Now to find a place to start! This speaks to me so perfectly right now. Thank you so much for sharing this and helping me get in the right mindset to set up our budget. I’ve been putting it off because it seemed so negative. So limited and draining. I especially appreciate the bit about being fortunate enough to be able to set one up. That means we have enough, or almost enough to be able to decide where it goes responsibly. It really helped me see it in a new light. Thank you!